There’s no denying the force of nature the gaming indie scene has grown into in recent years. The old barriers of entry for young, eager developers to the console market have greatly been reduced thanks to products like the Ouya – the wildly successful Android open console designed for the controller and tv play we all love. Despite the nay-sayers, Ouya has grown to offer dozens of innovative, fresh and unique games that showcase young talent in a way no console has before it. 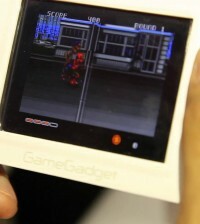 It’s also begun to see ports of games for other platforms as well. 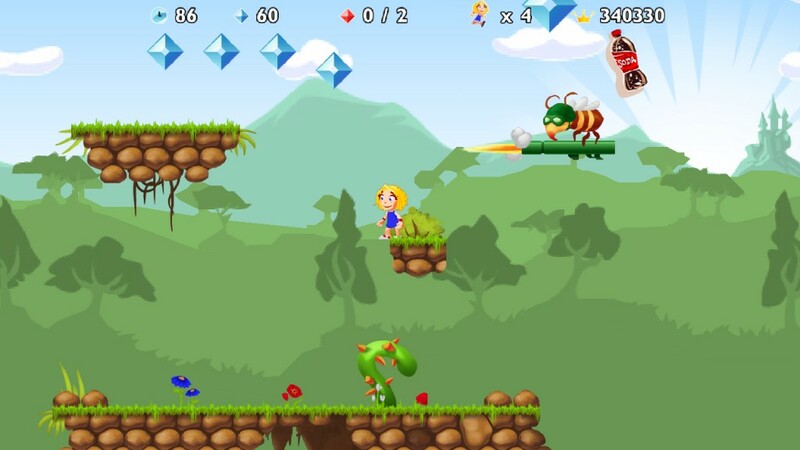 I was quite excited when I found out Giana Sisters, one of my childhood favorites, had made its way to Ouya. The C64 classic, The Great Giana Sisters. 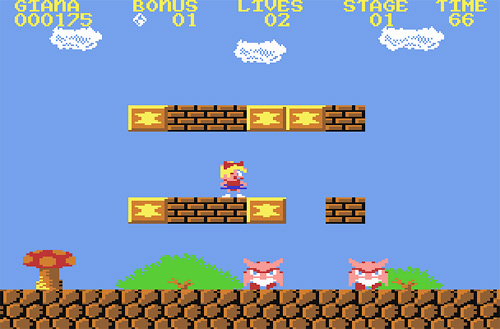 The Great Giana Sisters was one of my childhood favorite games for the Commodore 64. Although on the surface a blatant copy of Nintendo’s Super Mario Bros., TimeWarp Productions managed to release a game that felt familiar to Mario players, yet still had enough of its own charm to be its on unique game. Of course, the excellent Chris Hülsbeck soundtrack went a long way in making Giana Sisters one of my favorite childhood games. 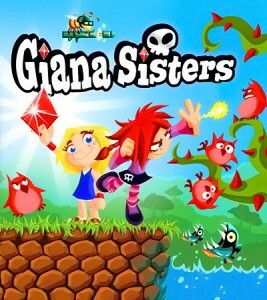 Of course, Nintendo wasn’t too pleased with Giana Sisters, and threatened legal action unless the game was removed from store shelves. That is why I was rather dumbfounded when Giana Sisters was revived and an extended remake was released in 2009 for the Nintendo DS of all platforms. 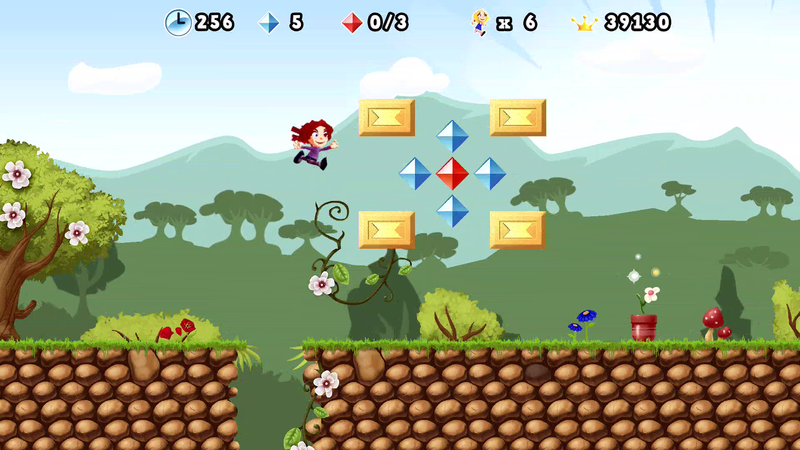 This was a Mario-style platformer that Nintendo blocked and then later embraced on one of their own platforms. Things had come full circle. 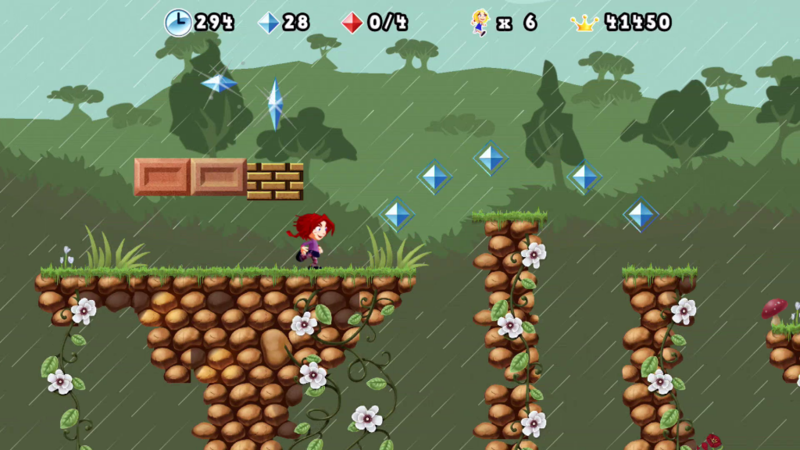 And now that same Giana Sisters remake is on Ouya, called simply Giana Sisters. Unfortunately, Giana Sisters on Ouya is not the wonderful experience the handheld version is due to several critical bugs. While their heart was in the right place, Kaasa solution, the team handling the port of Giana Sisters DS, didn’t really optimize their code for the Ouya. The issues are all minor, ranging from music playing before load times and complete, occasional enemy and platform clipping errors and controller lag. The problem is, these issues build on each other and snowball to ruin your experience with an otherwise charming, fun original game. The good news is that Giana Sisters maintains the same soundtrack as its DS cousin and is in full HD, replacing the sprites with some high-resolution graphics that make it look almost like a living cartoon. The game only costs $1.99 to unlock the full version, but because of the technical problems, I can’t recommend Giana Sisters as of version 2.0.2. Hopefully, there will be a future patch to fix the various performance issues.